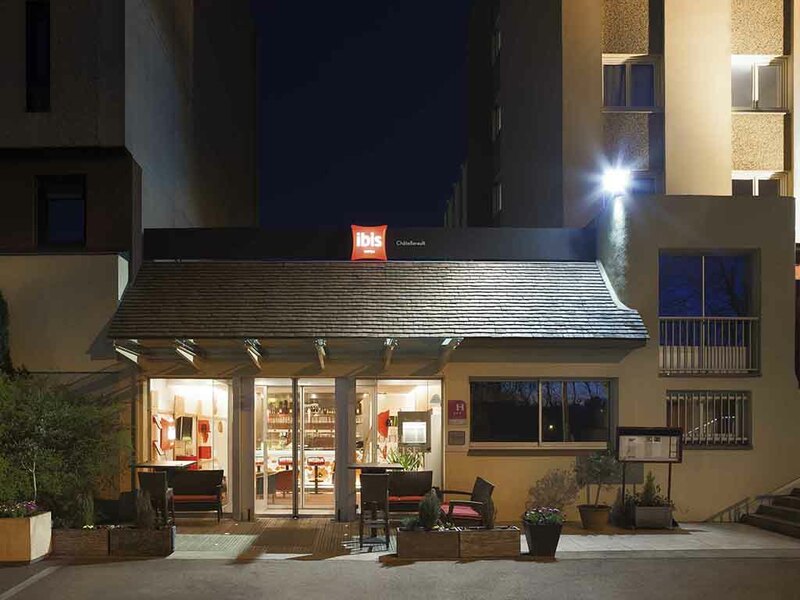 The ibis Châtellerault hotel is 1.9 miles (3 km) from the city center and the train station, and a stone's throw from the Forest of Châtellerault. In the heart of the Poitou-Charentes region, you are 15 minutes from Futuroscope theme park in Poitiers and La Roche-Posay casino, and 30 minutes from Chinon. The hotel offers 71 air-conditioned rooms and 3 meeting rooms. Close to a free public car park, it boasts a restaurant, a 24-hour bar with a terrace and WIFI for guests traveling for business. 1 min from the Châtellerault forest and fitness trail. 15 min from the Futuroscope theme park and the Casino de La Roche Posay. 30 min from Chinon, Bourgueuil and Saumur. 70 km to Brenne country park. The brasserie-restaurant invites you to sample its traditional, authentic and tasty cuisine. teh breakfast is more than correct. the welcoming is nice . maybe a little warmer atmosphere in teh bedrooms would be nice but otherwise great place for Ibis. ..and if you like running you have the forest m from the hotel, and they have a fanatstic chocolate Labrador who is so friendly ! Hotel stay was fine with comfortable bed and good breakfast following morning. Unfortunately I contracted food poisoning from eating oysters at “Chez Julien” and was ill for one week. State d one night on route to Spain. Have stayed here previously. Welcoming staff. Clean comfortable room. Good breakfast. Would recommend. The room is small but bed comfortable. We had only warm water at 5.00 however very hot in morning, possibly due to demand? The toilet plunger was broken but still worked. We were so tired we did not ask for problems to be sorted. We ate 8n restaurant next doir, it was not goid this tine. Friendly welcome, pleasant stay and very good food at the Brasserie. Hotel is a bit out of town but has a restaurant next door (a bit expensive) and a Macdonalds over the car park. There is also a supermarket 100M away. Plenty of free parking too. The hotel is close to the autoroute. The hotel bedroom room was quite small, though very clean and good bed linen l - we were a little disappointed that we had two single beds pushed together rather than an a double bed. We found the restaurant meal somewhat disappointing and expensive for what we had - sea food tower. The oysters were plentiful, however, the crab literally had no crab meat, the prawns were limited and the clams/mussels were tiny. The cheese plate was very disappointing with only one piece of hard cheese - we requested no goats cheese but had hoped for some brie and/or camembert or epoisses. A good budget hotel, with friendly staff and a very good attached restaurant. Also, for those travelling with a dog, there is a great park close by, just over a pedestrian bridge from the hotel. Also breakfast buffet is very well stocked. Good hotel - we would stay again. Comfortable and convenient to our journey through France. the rooms were good. Reception very helpful and breakfast good. We like the walk in showers but find the policy of one towel each which were very thin, the only reason to complain. Everything was OK. Special thanks to the lady at the reception (speaking Spanish) for her help to solve the issue with the missing receipt from restaurant back in November.